Discussion in 'General Pokémon Discussion' started by PetitBambi, Sep 16, 2018. Hello ! First time posting here ! I've been replaying ultra sun and I noticed Ilima's Smeargle, when using water gun does the absolute cutest animation in the world where he'll stick his tongue out before firing !! and it made me absolutely fall in love with this poke and want a smeargle that does the same ! Most texts n vids I can find on their movesets n anims are just people showing off ridiculous things they can do with legendary moves, but I just want that simple lil anim where he happily bleps and I get to see his darlin lil face !! You don't normally see your Pokémon's face in battle. For the most part, it's going to be facing away from you when using standard attacks. You can visit your Pokémon's status screen and tap it to cycle through its battle animations. Well yeah, I'm aware ! The thing is when it performs this specific animation, which I know will happen with using Water Gun and can execute easily that way - it does show its face ! It shows his profile and him sticking his tongue out ! 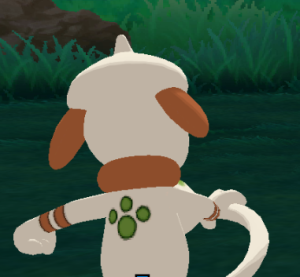 I just want to know if anyones aware of moves other than water gun that use this specific animation, since otherwise I'd have to go teaching him every single move he can learn and trying it out in battle to find out if it performs the same anim or if it's the swipe where he's only visible from the back and swings his tail around ! I think......that is the animation for special moves? While the tail swiping is for physical moves. The only way you can see the face is if the move involves the camera being in front of it while the animation is performed. Hmm that does make sense ! He does have other special moves (shadow claw, psychic) and performs the same swipe tho.. I'm starting to wonder if it's literally just exclusive to the 1 move and not performed for anything else..
also this is what I mean by seeing his face when he does water gun ! Psychic's animation doesn't change the camera, isn't it? I unfortunately don't remember all the moves' animation, so all I can say is try to look for moves that changes the camera into facing the front of the Pokemon when the move is performed.